Recently I found myself in a little predicament... like the cake is due in a few hours and somehow I didn't think to add wires to the large heavy flowers!! Somehow those flowers had to be attached to the side of the cake, and there was no way white candy melts or piping gel would be able to hold up something this heavy! The only thing that would surely hold these babies in place was to have them wired! But what do you do when you didn't add one in the beginning? 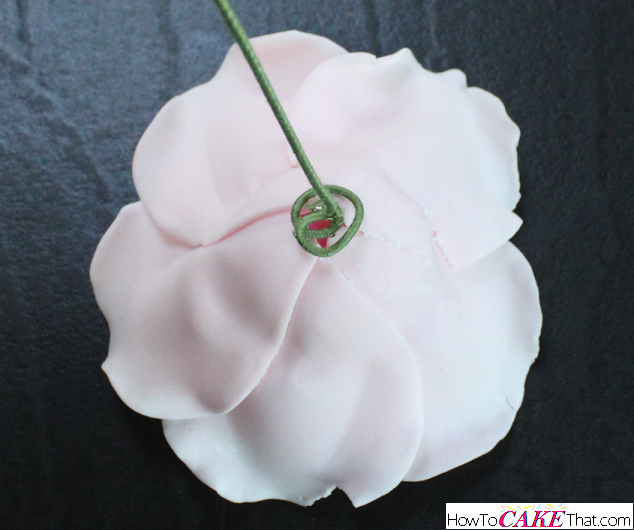 There's not enough time to add a ball of gum paste to the wire and use that to attach the flower! It wouldn't dry in time... not even with the "oven light on" method! As I frantically tore through my cake decorating cabinets, I found the answer!! So quick and so super duper easy!! And I'm sure if you have ever gotten into crafting you probably already have the special tool in your home! 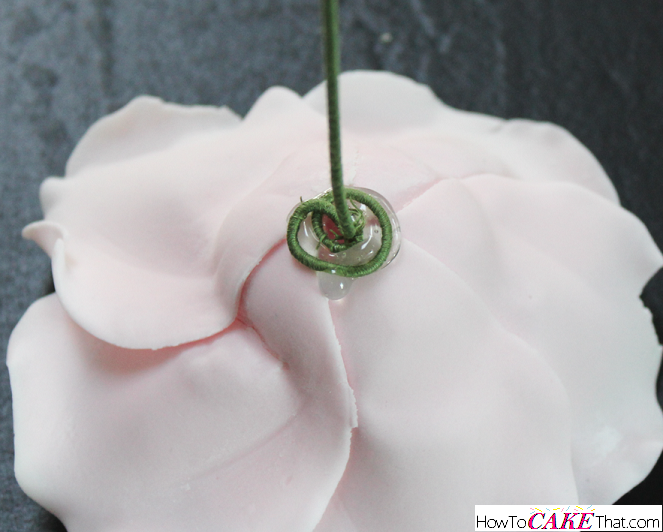 To begin, I needed to prepare my wire to be attached to my fully dry gum paste rose. Since my rose was pretty heavy I needed to use a thick gauge wire. 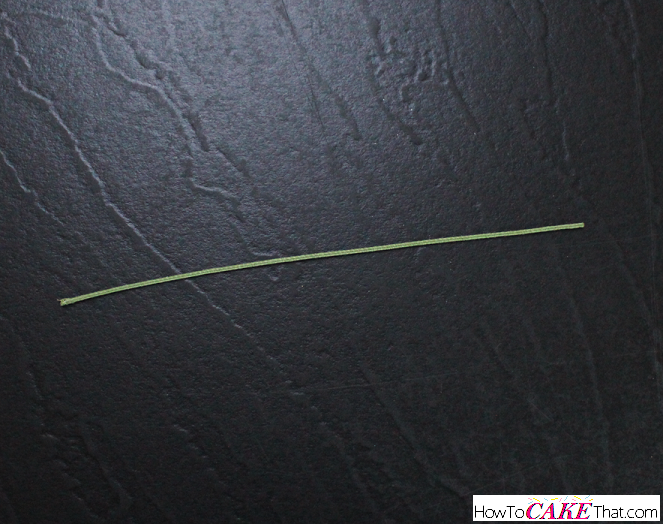 Here I have trimmed a piece of 18 gauge florist wire to an appropriate length for my gum paste rose. 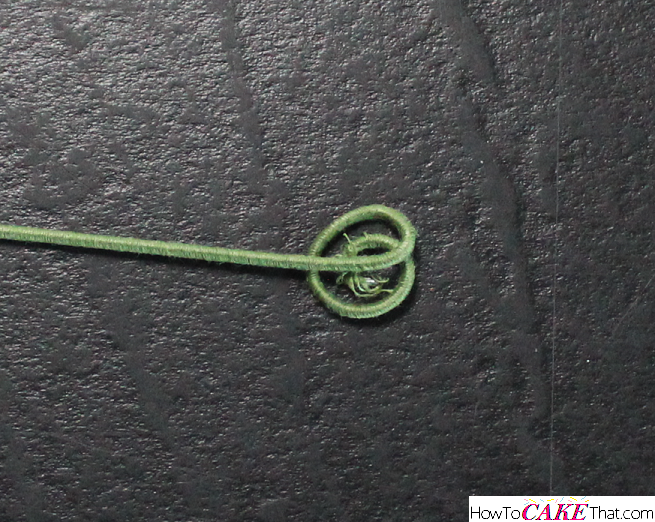 Next, a formed a small curl on the end of the florist wire using a pair of jewelry needle nose pliers. This curl will give us a wide area to help glue the wire to the rose. Next, press the wire that will be the "stem" flat against the spiral. Ensure the "stem" runs right down the center of the spiral. 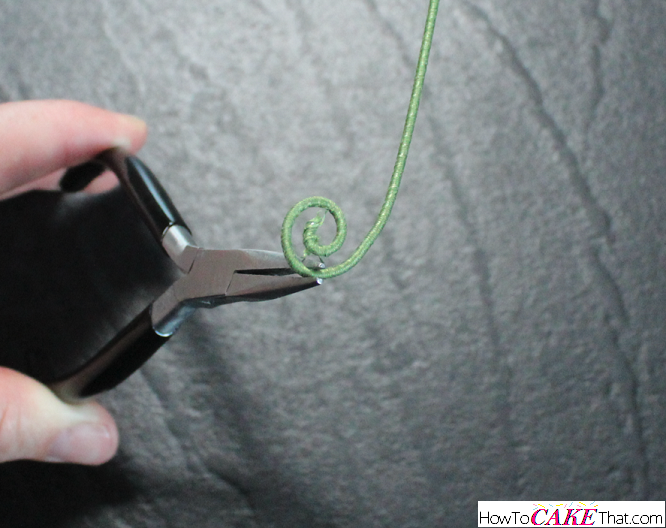 Using the jeweler's pliers, hold the spiral in place and bend the "stem" part of the wire into a 90 degree angle. You will want to spiral to appear like a little flat platform on top of the "stem". 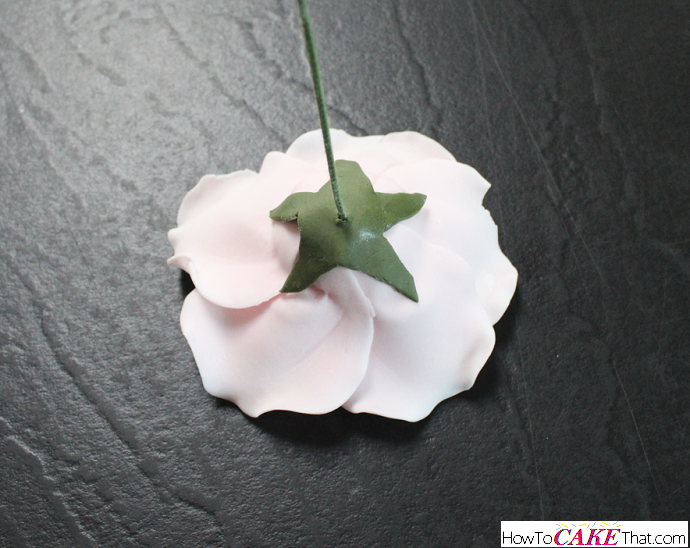 Hold the wire spiral to the back of the flower to ensure your wire spiral is large enough for your dried gum paste flower. You will want it large enough so the glue can secure enough wire to your flower to make it sturdy. But you don't want the wire spiral so large that it can't be hidden. Now for the special trick! 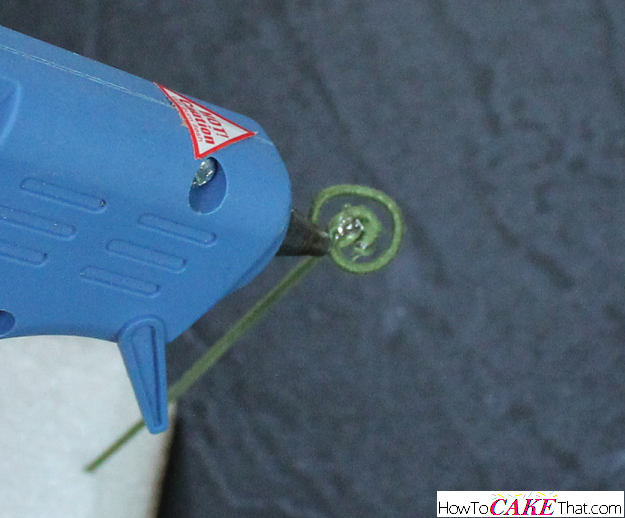 Use a hot glue gun to generously apply hot glue to the spiral. Be sure to cover the entire surface of the wire spiral. While the glue is still hot, quickly press the wire to the back of the flower and hold in place until it sets (about 30 seconds or so). 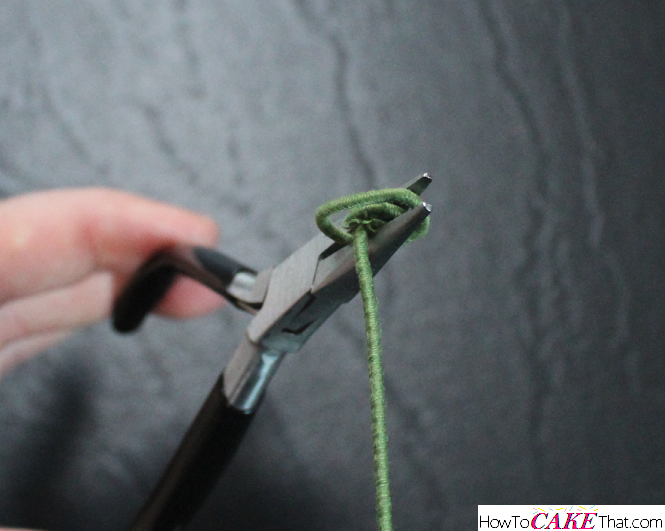 Hot glue likes to be stringy at times, so be sure to pluck off any stringy pieces. Allow the glue to fully cool (about 1 to 5 minutes, depending on climate and how much glue was used). Once glue is cool, you should have a sturdy bond! You should be able to hold the flower upside down and even sideways! I was very impressed at how well the hot glue bonded to the gum paste! 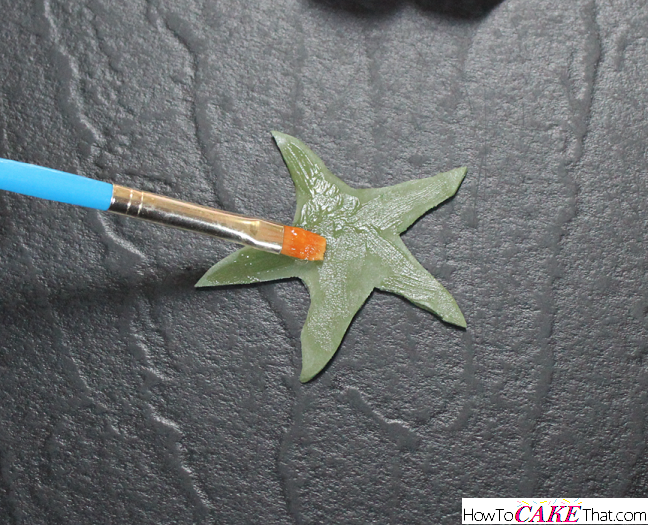 Note: be sure your gum paste has a non-oily surface and is completely dry before trying this. 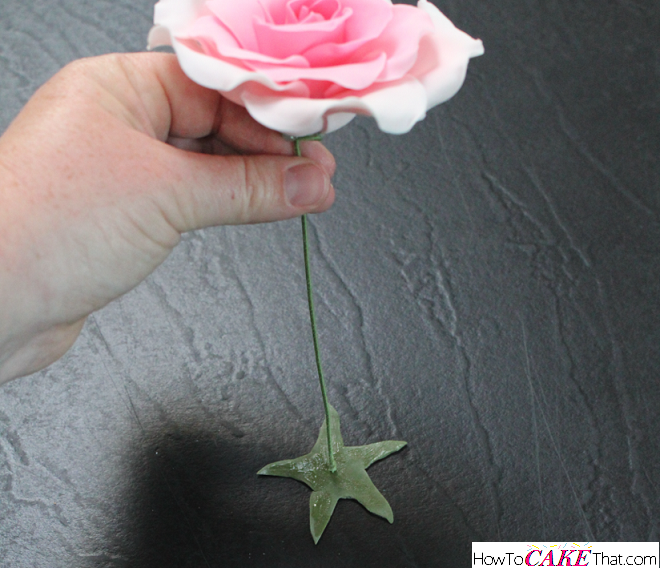 If there is shortening or chocolate (or anything else oily) on your flowers the bond may not hold as strong, or at all. Now just like florist wire, hot glue is typically not food safe, so a barrier must be created to protect the cake. 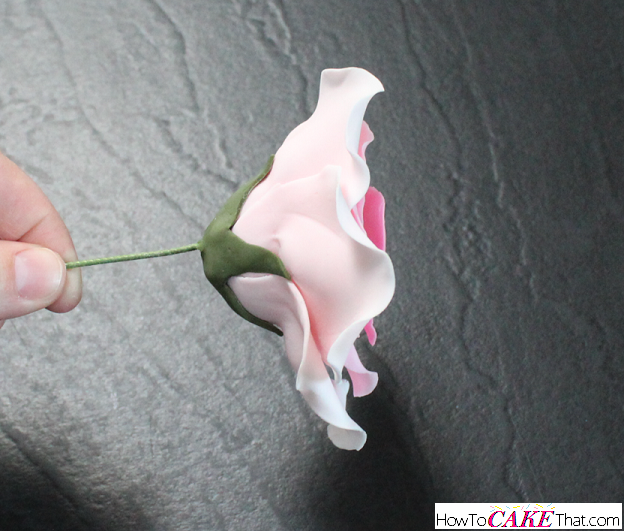 A simple and effective barrier is to create a calyx from fondant or gum paste large enough to completely cover the wire spiral and hot glue. 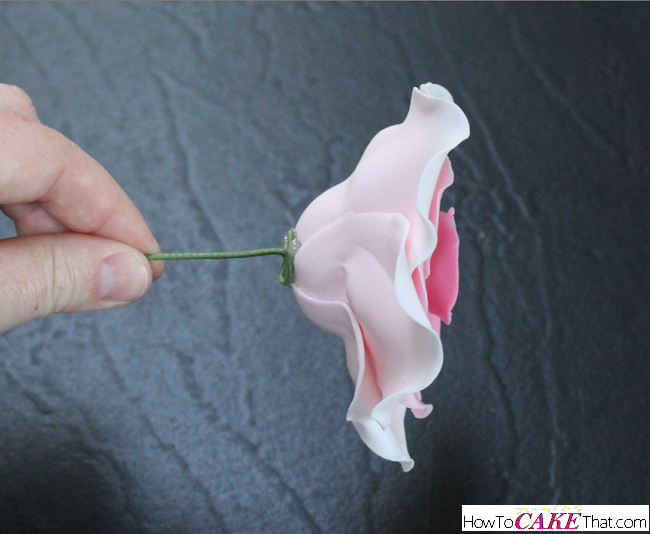 I brushed the back of my hand-cut calyx with piping gel to help attach it to the flower. Next, I set the end of the wire in the center of the calyx. Holding the calyx and the wire together, I quickly flipped the rose over and slid the calyx down the wire until it reached the rose. Look! A perfect fit over the wire and hot glue! Note: for an even quicker way to create a barrier between the cake and hot glue, melt down Wilton Candy Melts and paint the melted chocolate candy over the hot glue and wire. Look at that! So sturdy and so well hidden! 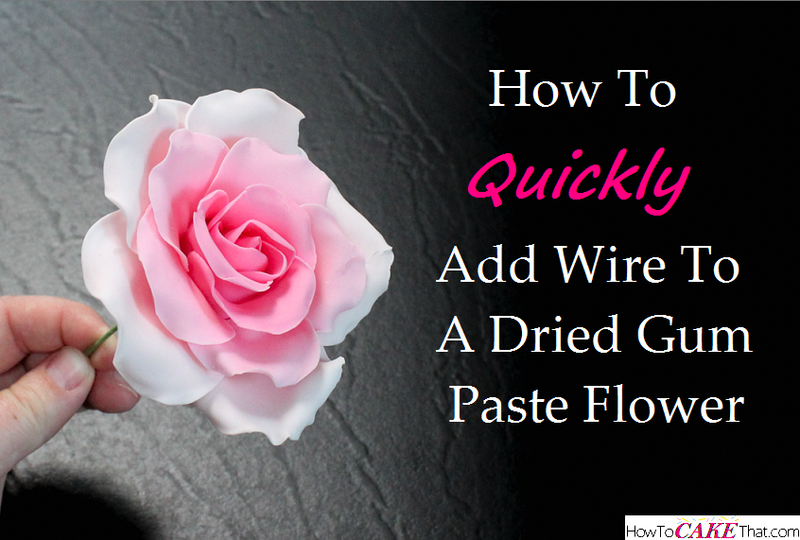 And it took me just minutes to add this florist wire to my already dried gum paste rose! I hope you have found this tutorial helpful! God bless! !